Repo Men (2010) is a sci-fi action thriller with the following synopsis. In the near-future, human beings are able to improve their life expectancy and quality through buying and implanting highly sophisticated and expensive artificial organs produced by "The Union". The Union will send highly skilled repo (repossession) men to take back the artificial organs (known as artiforgs), of which they claim as their properties if the patients fail to make payment. Remy (Jude Law) is one of the best repo men with The Union. He is fitted with an artificial heart after he almost died from a mishap during one of his repossession mission. When he fails to pay, The Union's manager, Frank (Liev Schreiber) sends Remy's former colleague, Jake (Forest Whitaker) to track him down and bring him in. 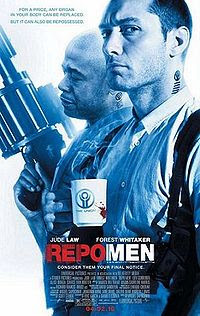 Repo Men reminds me of two movies in 2009 - Gamer (starring Gerard Butler) and Surrogates (starring Bruce Willis). Both movies are set in the near-future and related to technology and medical breakthroughs. Lately, I've watched quite a number of movies starring Liev Schreiber. In Repo Men, he's Frank, the manager of The Union, Remy and Jake's boss. In Salt (2010), he's Ted Winter, Evelyn Salt's colleague. He's also Victor Creed/Sabretooth, Wolverine's brother in X-Men Origins: Wolverine (2009), and Zus Bielski in Defiance (2008).